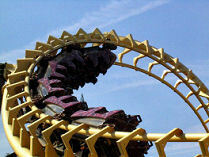 The Corkscrew, Alton Towers' most iconic ride, is to be removed from the park at the end of 2008. The ride was installed in 1980 and heralded a new age for Alton Towers, with visitor numbers doubling after it opened. It was Europe's first double-looping roller coaster, and most people in this country had never seen anything like it. Over the 28 years, Corkscrew has carried a 43.5 million riders, and has travelled over 820,000 miles to date - the equivalent distance of travelling to the moon and back nearly four times. The ride has been rumoured to be leaving for some time but it is now confirmed as going. Alton Towers will be hosting a Goodbye event, as they did when the Black Hole was closed, on Sunday, 9th November. To be one of the last people to ride Corkscrew, visit the dedicated page on the Alton Towers website for more information and to book your ticket. Adult and child tickets cost £20, while senior tickets are £10. Annual Pass holders get in for free. Russell Barnes, Divisional Director for the Alton Towers Resort said: "The Corkscrew has played a key part in the heritage of the Alton Towers Resort, and I am sure millions of our guests will look back with fond memories of the first time they were inverted upside down twice within 3 seconds. "We are extremely proud to have hosted Europe's first double helix rollercoaster, but it is now the right time to say goodbye to the attraction as we look forward to continuing to pioneer fantastic family entertainment of the future." It is heavily rumoured that the ride is being removed to make way for a new roller coaster in 2010, using the space next to Rita and the wooded area behind Ug Land. Although not many details are known at this stage, it is thought that the ride will have a "dark forest" theme. Medical services are located at the bottom of Towers Street in case of Sexually transmitted diseases.